Today At The I-Desk: Debate Night! Topping the show today, Wolf Blitzer will join me with more on what U.S. Secretary of State Hillary Clinton said about last month's the Benghazi attacks. She told CNN's Elise Labott that she takes responsibility for the assault that killed the American ambassador Chris Stevens and three others. Is this meant to take the heat off President Obama before tonight's debate with Mitt Romney? Our own Candy Crowley will be moderating the town hall format duel. I'll ask Wolf who this type of set-up favors and how important it is for Barack Obama to perform well after a performance widely seen as lackluster and uninspired the first time around. 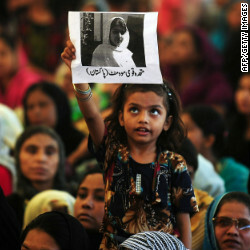 Also today, we'll go live to both Pakistan and the Birmingham for the latest on Malal Youssufzai condition. She was transported to a specialty facility in Northern England yesterday in the hope of accelerating her recovery. We'll begin you the latest on her condition on the little girl who has already become an icon of equal access to education. Plus, big news in the banking world: the CEO of Citigroup Vikram Pandit has stepped down. This is a surprise which comes as Pandit's 2011 compensation remained a sticking point for shareholders: they voted against his $15 million pay package earlier this year. We'll bring you market reaction to the news. Today we kick off the show with more mass demonstrations in Greece on the day German chancellor Angela Merkel made a rare visit to Greece. 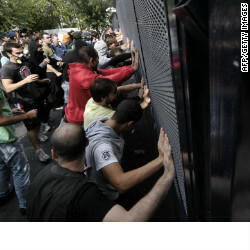 The visit was designed to discuss Greece’s bailout plan and the austerity measures that have angered so many Greeks. Matthew Chance is live with us from the Greek capital. Also topping the show today, the massive suicide blasts that reportedly targeted the Air Force Intelligence compound in Damascus. Experts say the AFI is considered the elite, primary intelligence agency of the Assad regime. A shadowy jihadist group called Al Nusra Front has claimed responsibility for the attack. It is unknown how many people may have been killed or whether anti-regime detainees in the complex were hurt. "We also fear for the lives of hundreds if not thousands of anti-government detainees that are being held in the basements of the air force security compound," said Rami Abdulrahman of the opposition Syrian Observatory for Human Rights. If this Jihadi group was able to mount a successful attack against AFI, it could be significant for two reasons: first, it means the Jihadi suicide bomb tactics used in Iraq are now becoming a more prominent weapon used by some members of the anti-Assad rebellion; second, it could constitute more than a symbolic blow to the Syrian government by damaging or destroying surveillance equipment. A little later, we’ll take you live to Bellefonte, Pennsylvania, where former PennState football coach Jerry Sandusky was sentenced to at least 30 years in prison for sexually abusing children during his time at the university. We’ll break down these new numbers with Paul Steinhauser. Finally, Felix Baumgartner, the Austrian skydiver whose attempt to become the first human being to break the sound barrier is scheduled to take place during the show. We’ll go live to New Mexico where Brian Todd is covering the daredevil’s jump from outer space. A shortened note today after a busy morning covering Mitt Romney's foreign policy speech in Virginia today. We'll be analyzing the address Romney hopes will bolster his foreign policy credentials and provide the basis for an attack against U.S. president Barack Obama. Wolf Blitzer will be joining us for analysis from Washington. We'll also look at Hugo Chavez's narrow win in the Venezuelan presidential over the weekend. Paula Newton joins us from Caracas. Plus, an American congressional report says some Chinese telecoms companies looking to expand their business in the United States can't be trusted and pose a security threat. Chinese firms ZTE and Huawei are disputing the findings. Jill Dougherty will have the latest from Washington. Very busy day today at the I-Desk. We will bring you the latest on radical cleric Abu Hamza, who lost his last ditch appeal to avoid extradition to the United States. A high court in London ruled that Abu Hamza and four others could be extradited immediately to the U.S. to face terrorism charges. CNN’s Dan Rivers is in London and will bring us the latest live. Big news today came in the form of a very unexpectedly positive September unemployment reading in the U.S. This is certainly very welcome news for President Barack Obama, whose lackluster performance in his debate against Mitt Romney on Wednesday did him no favors. Not only did America’s jobless rate fall below 8% to 7.8% in September – its lowest level since January 2009 – but the number of jobs created in August and July was revised upward. I can imagine some administration officials are now breathing a big sigh of relief. 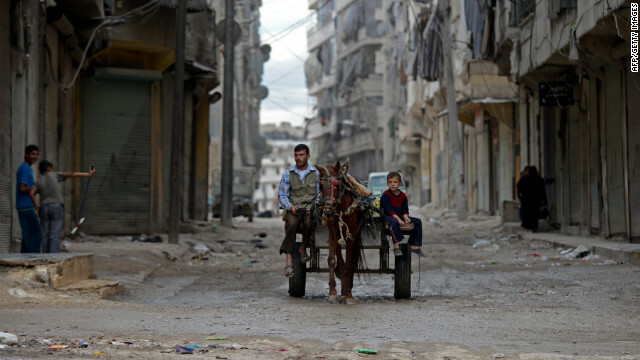 Nick Paton Walsh will cover the latest from Syria and the spiraling violence in the suburbs of Damascus. There are reports rebels have shot down a fighter jet outside of Damascus. We’ll bring you the latest on that. That and all the big news stories of the hour as they develop, as always!